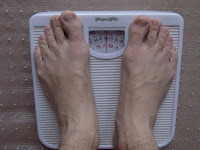 There are many opposing ideas on how often you should weigh yourself when trying to lose weight. I for one find myself needing to weigh myself everyday, mainly because if I do not it is on my mind all day, wondering how I am doing and if I am really messing up. The downside to this is how much body weight can fluctuate from day to day due to water intake, sodium intake, and a plethora of other variables. These fluctuations can really cause havoc on ones emotional state if they pay too close attention to what the daily weight actually is. This can give you emotional highs and lows and if not careful can actually derail an otherwise very healthy change in lifestyle. I found myself at times falling into this trap and getting really depressed when I found myself down to a new low only to find myself up a couple pounds the very next day. I am sure these fluctuations can be explained to a certain degree, but to the non scientific like me they are unexplainable. Take for instance this past weekend. I woke up Saturday morning to a weight of 177.0 on the scale. The previous days before I was hovering in the 177.x range so this wasn't too surprising, in fact I was pleasantly surprised because I had not seen that low before. I then proceeded to get myself ready and went out for my long run of 14 miles as I am preparing for a February Half Marathon (follow my progress here). I then spent the rest of the day being quite active including playing some baseball as well as eating very well. The shocker came when I got up This morning, just two days later and the scale said 179.0. How could this be? I just ran 14 miles, and then ate very well for two days.... and then an increase of 2 lbs?!? I used to let these fluctuations bother me, but as time has progressed I realize that these are normal and in my opinion very hard to explain many times. I have found that it is much easier for me to stay focused and not get the emotional highs and lows if I look at the trend that these daily weights give me. Many months ago, during one of the times I was having trouble with the emotional bouncing I came across a site that will do the trending for you. I have been using Physics Diet ever since, and have been very happy with the results. It lets me know if I am still on the downward trend, and how fast this is occurring. You can take a look at my chart by following this link > My Public Profile. I highly recommend that if you do decide to weigh yourself daily that you take the daily weights with a grain of salt and you focus more on the trend, as that is where the real truth can be found. Thanks for the support for me by the way. I've been weighing myself daily as suggested by the Hacker's Diet, so I can get into the habit, and so that I can start tracking the trending. The emotional ups and dows are maddening, and I almost stopped. But... I did a morning weigh in a week after my monthly weigh in and had dropped the desired 2 pounds... Sheer motivation.